Fusing vintage influences with the modern psychedelic, Israeli multi-instrumentalist and composer Ophir “Kutiman” Kutiel captures the essence of the great funk. 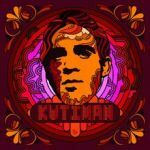 Loaded with scratchy guitar riffs, horn arrangements, and the catchy vocal hooks of his affiliate musicians, wonderfully produced Kutiman’s first full-length album delivers everything we love about hip-swaying funk and the feeling of the 70’s. Dabbling in afro-beat, soul and disco grooves, Kutiman keeps my head spinning and my feet moving. Intoxicating experience for your body and soul. Posted by Julija on Wednesday, December 12th, 2007 under funk, israeli. Thank You for turning me onto Kutiman. I’ve been bopping around to “Music Is Ruling My World”. It’s making my day that much better. Yes. Thanks for the reminder, dirkhaim. “No Reason For You” is such a groovy track. Excellent, thanks for sharing this gem! The spacey groove of “No Reason” is making my morning delightfully less mundane. Thanks! This music made me want to remove my skin and roll around in it. the Kutiman music is amazing. I am from israel and bought his beautiful record a couple of weeks ago. this one is a real treat, one of the albums for 2007. I love this! Probably one of the best aurgasm picks! Wow, these songs are amazing. Great find. Thank you.